If you think the battery life only lasts 2 hours then I would highly suggest to just ask for a replacement. Anyway i'll inlcude documentations on how you can calibrate or properly set the settings in order for you to optimize your laptops battery life. Please take time to read the articles. 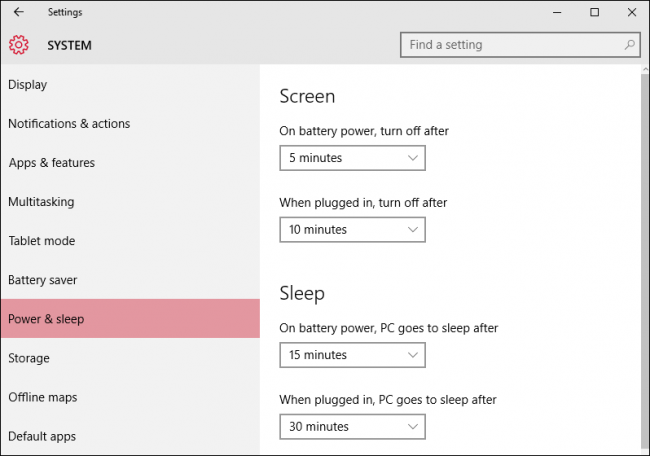 Windows 10 includes a new “Battery Use” screen that shows you what’s draining your laptop’s juice. That means it’ll tell you exactly what apps–both desktop and Windows 10 “universal” apps–are using too much power. This feature is part of the “Battery saver” screen in the new Settings app. Like some of Windows 10’s other new features, it was originally part of Windows Phone, but came to the desktop when Windows 10 was released. It’ll break down how much battery power your display and other hardware uses, too. 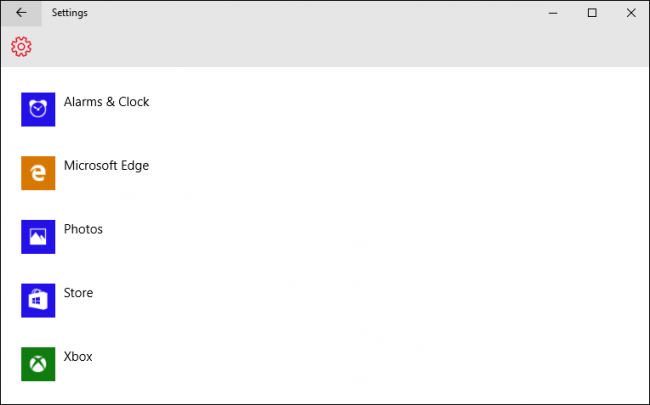 This feature is new to Windows 10, so you won’t find it anywhere in the old Control Panel. It’s located in the new Settings app, which you can launch by clicking or tapping the “Settings” option in the Start menu. 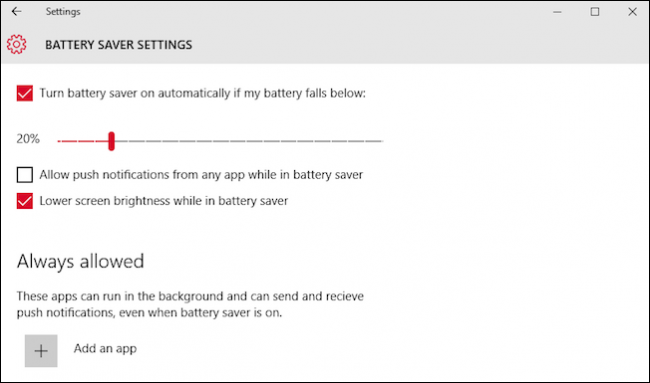 In the Settings app, select “System” and then select “Battery saver.” You can also just type “Battery saver” into the Cortana search box and select the “Battery saver” option to go directly to this screen. On the right side of the screen, you’ll see an overview that displays how much battery life you have remaining, and how much time Windows estimates you’ll get from that. Click or tap the “Battery use” link under this heading to see more details. By default, the Battery Use screen will show information from the last 24 hours. However, you can also have it show information from the last 48 hours, or from the last week. 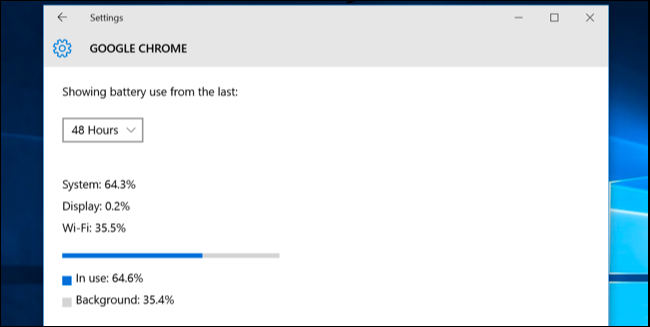 Below this box, you’ll see “System,” “Display,” and “Wi-Fi” percentages. This shows how much battery power has been used by system processes, the display, and your Wi-Fi radio. You’ll probably see that the display is using quite a bit of power. To alleviate that, try lowering your screen’s brightness, or tell your display go to sleep more often in Settings > System > Power & Sleep. The “In use” and “Background” options show how much power is used by applications while you’re using them, compared to applications running in the background. 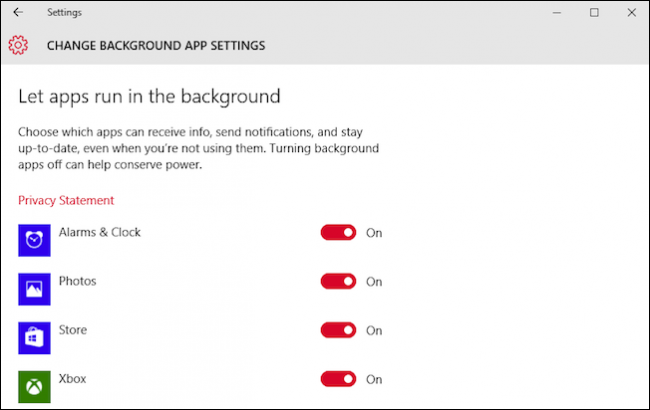 If apps are using power in the background, you can click or tap the “Change background app settings” link and configure apps to not run in the background. This only works for universal Windows 10 apps. They won’t automatically receive notifications, fetch new data for live tiles, or perform other background tasks. This can help you save battery power, especially if you don’t actually use those new Windows 10 apps. Scroll down further and you’ll see a list of applications. This is the most useful part of the list, as it lists your desktop applications as well as universal apps. It’ll display a list of the apps have have used battery power in that period, and show you what percentage of your battery power each app has used. If an app doesn’t appear in the list here, you never used it while you were on battery, so it never consumed any battery power. You can view more information about a specific application’s energy usage by clicking or tapping it and then selecting the “Details” button. You’ll be able to see how what percentage of power the app used for system processes, the display, and Wi-Fi. You’ll also be able to see how much power the app used while you were actively using it, and how much it used when running in the background. You may see the word “Allowed” beneath some Windows 10 universal apps in the list. This indicates they’re allowed to run in the background. You can select an app and then select the “Details” button to see more details. From here, you can disable the “Allow this app to run in the background” option and prevent the app from using power in the background. There’s no way around it: All applications you use will drain battery, and whatever applications you use the most will likely rank high in the list. Demanding applications–for example, demanding PC games or video compression programs–will also use a lot of energy. 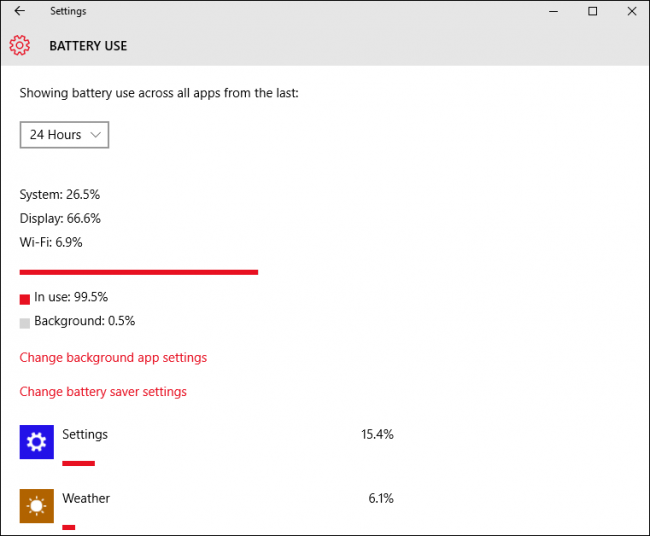 The Battery usage screen provides options for controlling whether Windows 10 apps can run in the background, which should help you if you’re using that type of app. But there’s no way to control Windows desktop apps from the Settings screen. If a desktop application is sucking down a lot of power while running in the background, you may be able to save power by closing it when you’re not using it. If an application is using a lot of power while you’re using it, there’s not necessarily much you can do. You could try looking for an alternative application that isn’t as power hungry, or try to make the application more lightweight–for example, by uninstalling browser extensions, enabling click-to-play plug-ins, and having fewer tabs open at once in your web browser. It’s not just apps, either–plenty of other settings can affect your battery life. The display backlight uses quite a bit of power, so lowering your display brightness will help. Having your PC automatically sleep more quickly can also help if you’re not in the habit of putting it to sleep when you step away. 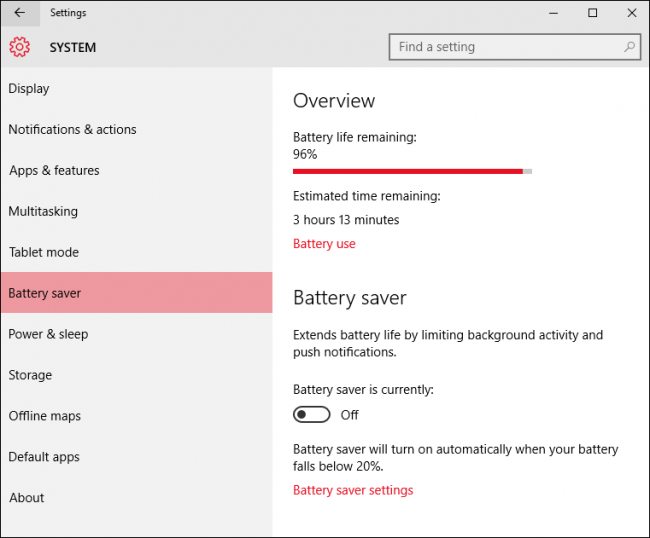 Check out our guide to Windows battery life for more details on getting the most out of your laptop or tablet. Have you run the battery diagnostic either within HP Support Assistant or in the UEFI diagnostics (F2)? Yes, the battery is covered by the warranty, but it is not easy to get HP to honor a warranty claim on a battery that still works to some extent. Still, the amount your battery life has declined may indicate a hardware issue like a dead cell and if you can show that you have a dead cell HP will very likely replace it for you. I would say they will replace it but I am not in a position to make promises as I do not work for HP. Also as you know the battery is internal so it is not as easy as HP's just sending you a replacement. It would have to be sent in for warranty repair unless you have onsite.